Cross Stitch Nation [H1483] - $10.00 : Yarn Tree, Your wholesale source for cross stitch supplies. Cross stitch pattern by Heartstring Samplery. A row of men and women all holding a stitching notion. 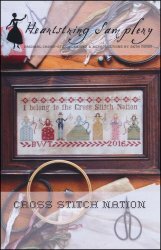 Across the top is "I belong to the Cross Stitch Nation". Stitch count 200 x 83.